It’s a general rule for most people: it is much easier to warm up than it is to cool down. The reason for this is energy. The body naturally creates energy, which is a heat source. As such, taking away this heat is considerably more difficult than generating it in human beings. This same principle which we see in humans is in operation in a mechanical cooling system as well. Heating, ventilation, and air conditioning services, otherwise known as HVAC services, is an industry which provides the installation of heating and cooling systems. Ventilation is also a major factor in this business. HVAC contractors provide three main categories of customers with heating and cooling services: residential, commercial, and industrial clients. Let’s take a look at all three of these areas and assess how the cooling system operates in each instance. For health, comfort and resale value reasons, air conditioning is practically a necessity. In fact, approximately two-thirds now have air conditioners. Gone are the days when air conditioning was a luxury! A residential air conditioner provides a cooling system for a majority of American homes. For proper operation, the type of maintenance that is suggested includes changing the filters quarterly (by Energystar.gov), making sure the system is properly insulated, preferably by professional insulation contractors, and having the system and the heat pump inspected twice a year. This will help avoid the need for HVAC repairs. 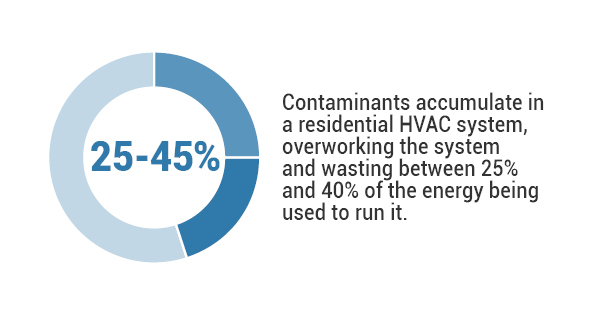 According to the U.S Department of Energy, contaminants can accumulate in a residential HVAC system, overworking the system. This can waste between 25% and 40% of the energy being used to run it. So, it is imperative to keep the unit clean and well-maintained. Also, it is important to know your energy usage. Some other ways to keep residential air conditioning costs down include the use of a fan in the home, lowering your blinds during the day, and by keeping the thermostat temperature up (rather than down). These tips will help to avoid air conditioner repair due to overtaxing the cooling system. Industrial air conditioning is an absolute must to keep materials, equipment, and products from overheating. In a large industrial environment, the air conditioning is more commonly referred to as a cooling system. This system is critical to the effective operation of the business so proper upkeep is of utmost importance. A commercial cooling system operates in an area which sees a lot of foot traffic, such as a restaurant, school, mall or airport, just to cite a few examples. It is designed mostly for the comfort of the clients and employees, and it also works to keep merchandise fresh. Emergency HVAC services in this commercial category can be highly disruptive. Repairs can cause closings or delays which are inconvenient and expensive. Of course, the objective is to avoid problems and repairs by practicing good HVAC maintenance and preventive upkeep. To sum up, HVAC companies are willing to audit your home energy. An HVAC cooling system has many benefits for homes and businesses alike, improving the quality of life for many. It requires consistent professional upkeep to keep operating as smoothly as possible. So the next time you hear someone saying “Cool it!”, you’ll know that it’s actually easier said than done!